A peerless playwright needs pants. I use pants in the North of England and American sense. Trousers, specifically, not underwear. 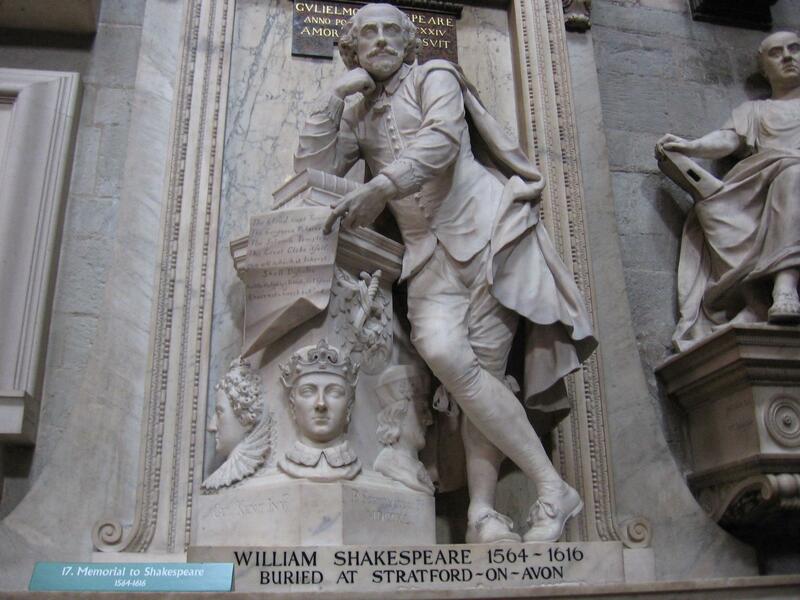 The first statue of Shakespeare – his funerary monument in Holy Trinity Church, Stratford-Upon-Avon – has no pants at all. Sculptor Gerard Johnson simply opted to cease Shakespeare at the hips. I am not sure how Shakespeare would have felt about this. My guess is, not good. As Shakespeare became more acclaimed and beloved by writers, and people with lots of money, he was finally accorded pants in Westminster Abbey, though William Kent, the designer of the 1740 monument commissionsed by Alexander Pope, Lord Burlington and a gaggle of other prominent admirers, chose simple, long breeches. And now we must begin to speculate about the type of dresser Shakespeare was. Was he a fashion conscious chap? Because if he was, the evidence points to a very different set of pants to Kent’s interpretation. Elizabethans were very proud of their linings. So much so that if there was silk or something sumptuous underneath, they would slash the top layer and pull out the stuff underneath to show it off. Acclaimed actor David Garrick, whose famous representations of Shakespeare reside at London’s Garrick Club and in his Thameside Temple, chickened out of confronting the whole fashion question. He opted for a bust. Thomas Banks took the breeches route for his Shakespeare Gallery in Pall Mall in the 1790s. No: leave it to New York to accord the Bard a firm fashion sense. Readers yesterday evinced surprise that Robert Burns resides winsomely in Central Park. He does. In fact there’s a small writer’s commune in bronze if you stroll the right way through Central Park. And the Bard himself stands watching passers-by. Three hundred years after his death in 1564, the New Yorkers decided it was time to put the record straight. They held a charity performance of Julius Caesar, and raised the cash for John Quincy Adams Ward to fashion some decent pants. We wandered off the street into Central Park, Englishmen in New York. Is it wrong to be drawn inexorably to Shakespeare’s pants? They were absorbing. Every detail the height of Elizabethan fashion. Never have I seen such pants. England, Shakespeare’s birthplace, couldn’t touch them. They are magnificent, and I feel sure that whatever he wore, Shakespeare would be proud indeed of them. Posted in Literary lives, Places to visit, Quirks of HistoryTagged Central Park, sculpture, shakespeare, Stratford-Upon-AvonBookmark the permalink. They are such frivolous apparel; surely one would have to be out on the town to show them off and not at home scribbling away. ….although maybe Sunday best, Sidey? To curtsey to Queen Bess? Cool couplet, Roger. And slashed pants? M&S would blanche. No, thank you Ms. Kate! Duct Tape makes for interesting fashion. Indeed, Lou. More like London fashion than New York. Still, you know these creatives. He’ll have a safety pin in his nose next. Half a man with arms is better than a mere bust. I wouldn’t begin to know what shoes to wear with those pants! Yes it is! One day, mark my words, those pantaloons will return to the world’s catwalks. Shakespeare cuts quite a dashing figure in those pants. Stunning. I was wondering when you were going to write the post giving a shout out to NYC’s version of the Bard’s knickers. Yes, these breeches re impressive, but in defense of the Gerard Johnson sculpture, possibly Will is sitting cross-legged inside that box? Ah, you forgot another — perhaps purely British — definition for ‘pants’, which I immediately thought of before I read your post, wrongly as it turns out: Shakespeare’s pants? You realise this goes against the opinion of posterity which thought the Bard was ace? No, great fashion sense from those New Yorkers of yore. Kate, I wouldn’t enthuse too much about those New York pants. There’s no cod piece for the bard to relieve himself! I never knew about this part of Central Park. What an amazing find! I can see why these particular pants most certainly caught your eye. They are magnificently detailed. I think this must have been a very nice surprise! I’m glad New York furnished the Bard with proper pants. I’ve read that men in those days liked to show off their shapely legs with different colored hose. Makes me rethink the current fashion of some of youth, with their pants down to their, well, you know where, and their undies showing. Maybe they are all poets-in-the-rough. ha! Only you, dear Kate, would find such a pants-worthy pose whilst crossing the pond. Such a Dandy! Those are some PANTS. 😉 I had no idea that was there… The only time I’ve ever spent any real time in Central Square, we were there for the red gates, and then got distracted by the Castle.